The American Civil War proved to be one of the bloodiest, most devastating wars in United States history, claiming more than 600,000 lives within four years. However, twice the number of soldiers who lost their lives in battle died as a result of disease. Poor sanitation and unsophisticated medical care contributed to the contraction of illness, as inhospitable conditions in prisons advanced the spread of disease. Libby Prison, located in the Confederate capital of Richmond, Virginia, infamously housed Union soldiers, officers, and prisoners of war during the Civil War. Conditions were far below the normal standard of living. Overcrowding, food shortages, limited supplies and rampant disease plagued the prison. Commanders at the three-leveled complex designated less than a dozen rooms for inmates, sometimes allotting hundreds of prisoners only a handful of cells measuring 40 by 100 feet. On November 28, 1863, the New York Times published a story titled “Horrors of Richmond Prison: An Average of Fifty Victim a Day” that detailed the horrendous conditions from the perspective of recently released surgeons. Within the article, the men professed that “judging from what we have ourselves seen and do know, we do not hesitate to say that under the treatment of systematic abuse, neglect, and semi-starvation, the number who are becoming permanently broken down in their constitutions must be reckoned by thousands.” This article, in addition to other testimonies from escaped and released inmates from Libby Prison, served as persuasive fodder for the North to express outrage over the depravity of the Confederacy. 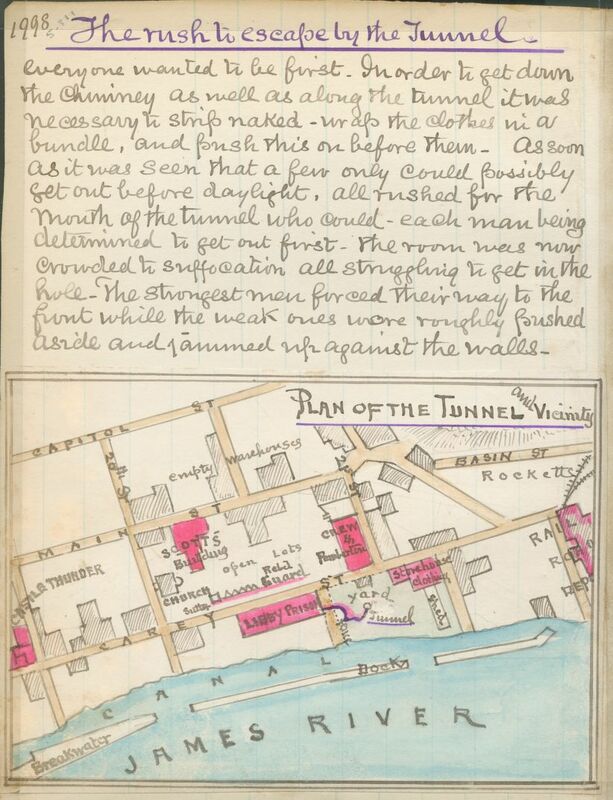 Map of an escape tunnel from Libby Prison, Richmond, Va., showing surrounding sites including other prisons, warehouses, the canal and dock closest to Libby, and the railroad depot. In February 1864, a group of 109 inmates attempted to escape Libby through a tunnel they had dug over several months; scraping and digging out the mortar between bricks often until four in the morning. Under the direction of Colonel Thomas Ellwood Rose and Major A.G. Hamilton, imprisoned officers earnestly but covertly carved out the tunnel behind a stove in the kitchen, measuring 50 to 60 feet and at one point with a width as narrow as 16 inches, using chisels and a wooden spittoon, all while fending off squealing rats, the “sickening air, the deathly chill, and the horrible, interminable darkness.” With many past attempts to escape ending poorly, the “Great Escape Plan” also risked detection by prison officials. After the escapees emerged on the other side, many set their sights on Williamsburg, 100 miles to the southeast, where General Benjamin Butler’s forces were stationed. Another group of men sought refuge in the home of Elizabeth Van Lew, a Union spy who during the course of the war strategically used her social affluence and air of feminine virtue to help Unionists escape the Confederacy. The first group of escapees crossed into Union lines on February 14, five days after the initial breakout. In total, of the 109 officers who successfully escaped the dreaded prison, “fifty-nine reached safety, two drowned [crossing the Chickahominy River], and forty-eight were recaptured,” the valiant Colonel Rose among them. As a punishment, the apprehended were thrown into Libby’s rat-infested cellar and denied adequate rations. More than a dozen Libby Prison escapees eventually reached Washington, D.C., where they diffused their accounts to anyone willing to listen about the abuse they faced at the hands of Confederates. On April 3, 1865, Confederate forces set fire to their own capital in a panic to escape a Union invasion. Major Thomas Turner, the last man at Libby Prison, frantically collected his belongings and systematically destroyed all prison records. While Turner escaped punishment, other former Confederate loyalists could not say the same. After years of inflicting pain and suffering upon thousands of Union soldiers, Libby Prison became a holding facility for the ‘Rebels,’ but this time, every prisoner slept on a bed and received regular rations.